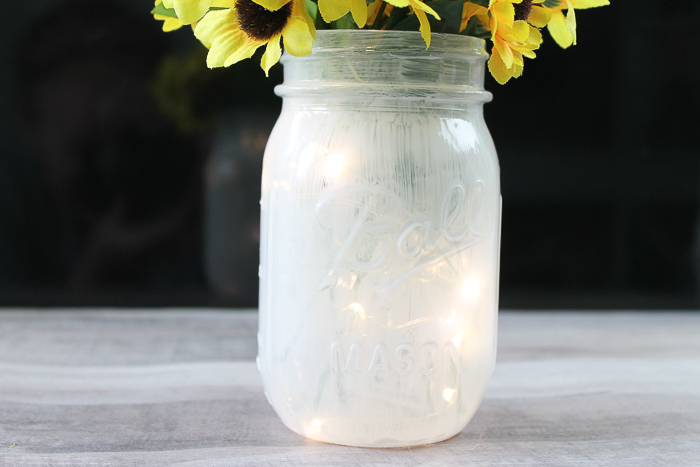 Want to add a little light to your home decor indoors or out? A fairy lantern is the answer. You can light up a centerpiece with this technique or a small side table for some ambient lighting. Whip up one or a dozen while you have your supplies out. 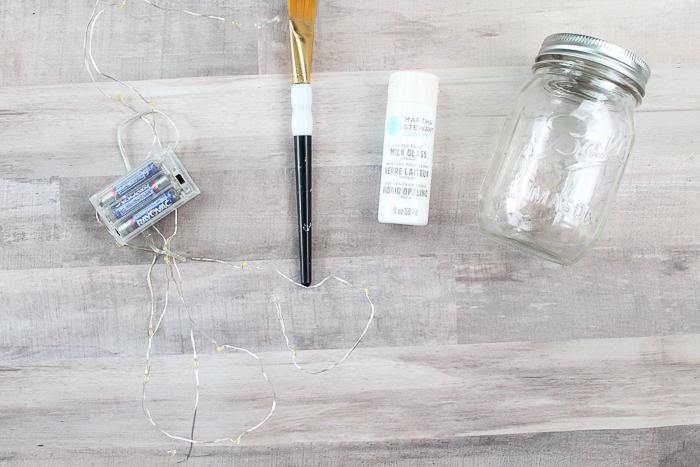 I am also sharing even more projects you can make with supplies from the dollar store below so don’t miss those! First, you can watch the video below on how to make your own fairy lantern. Can’t watch the video or missed some of the steps? Just follow along below! Clean your mason jar really well before beginning. Rubbing alcohol is great for this. Allow to dry completely before continuing. Paint all sides with the milk glass paint in the color of your choice. Set aside to dry completely. 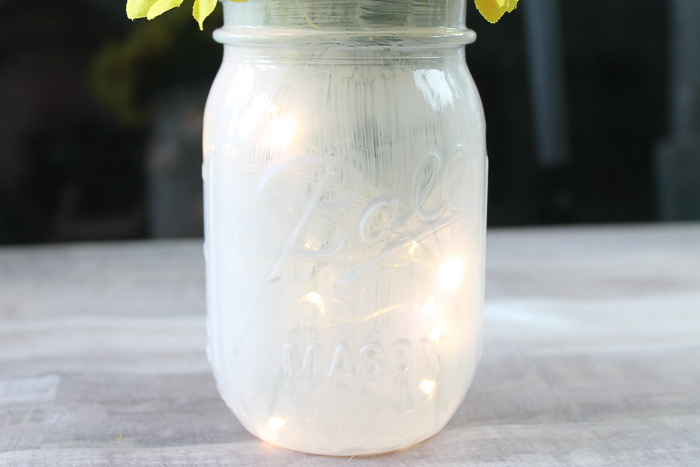 Once dry, you can add in your battery operated fairy lights to the inside of the jar. 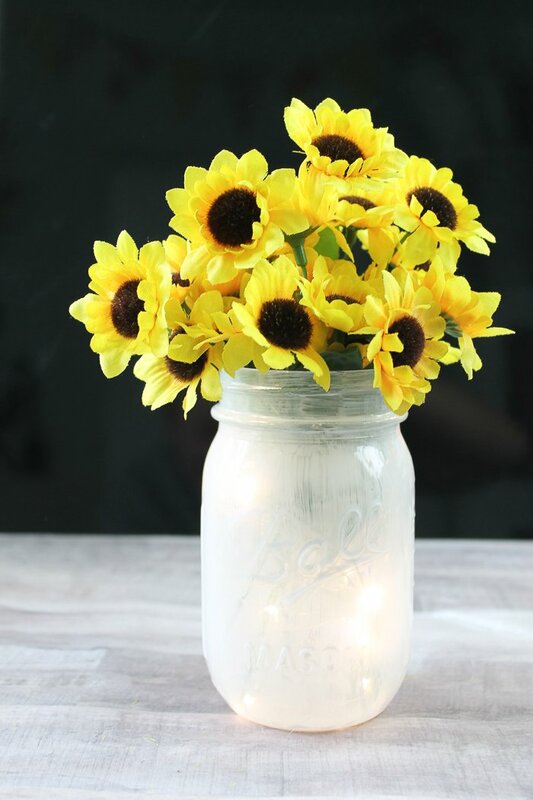 Then top off your mason jar with some faux flowers to complete the look. Then just switch on your lights whenever you want a bit of light in your decor. The paint is opaque so the lights shine right through. You can add a second coat if desired but the lights will not shine through as much. 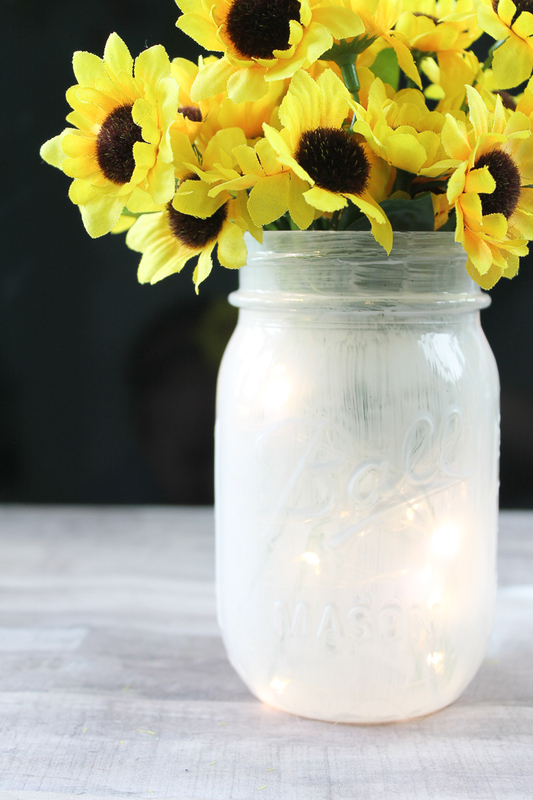 Use opaque glass paint for a see-through jar that still has a touch of color. Here we went with white but you can mix things up with any color that you desire. Don’t love the sunflowers? Be sure to pick your favorite flowers for this project. 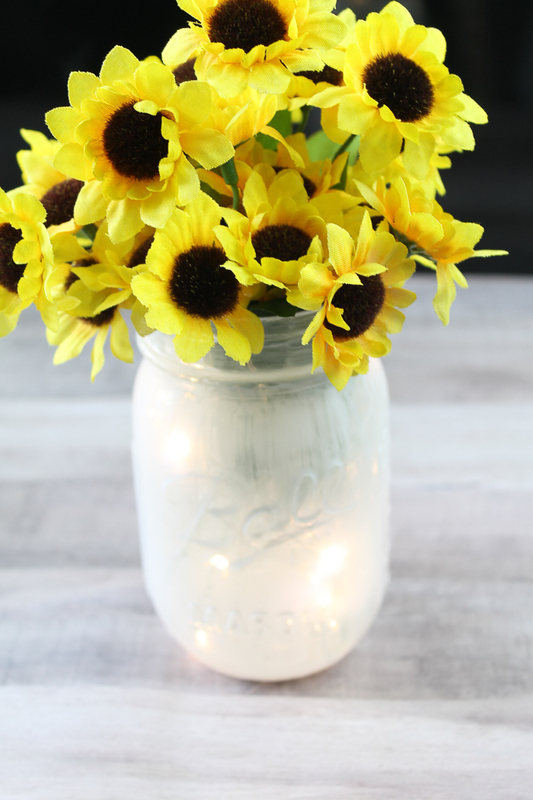 I love the soft glow from this mason jar under a cute bouquet of sunflowers. 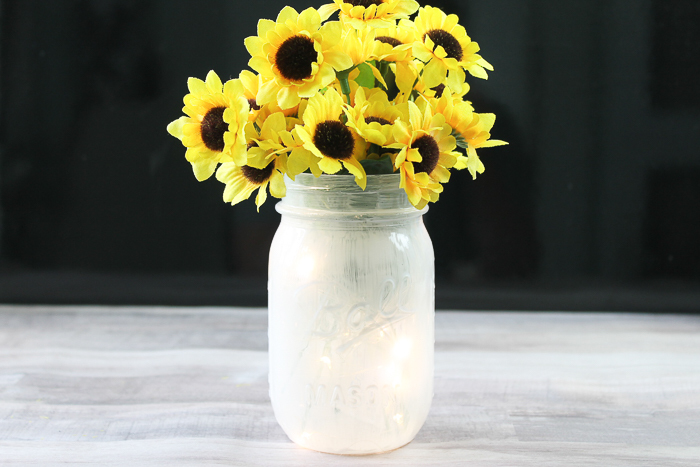 Add your favorite flower to this jar to really show them off. This project would also make great wedding centerpieces. 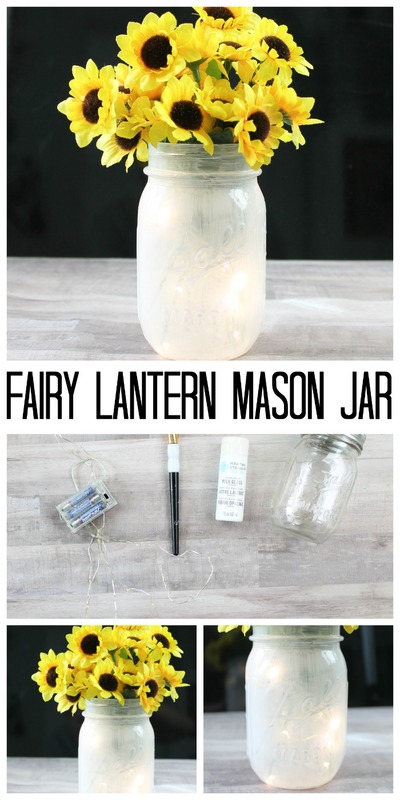 Will you make a fairy lantern from a mason jar? Why stop with one? Grab your supplies and whip up as many as you would like for every room in your home! 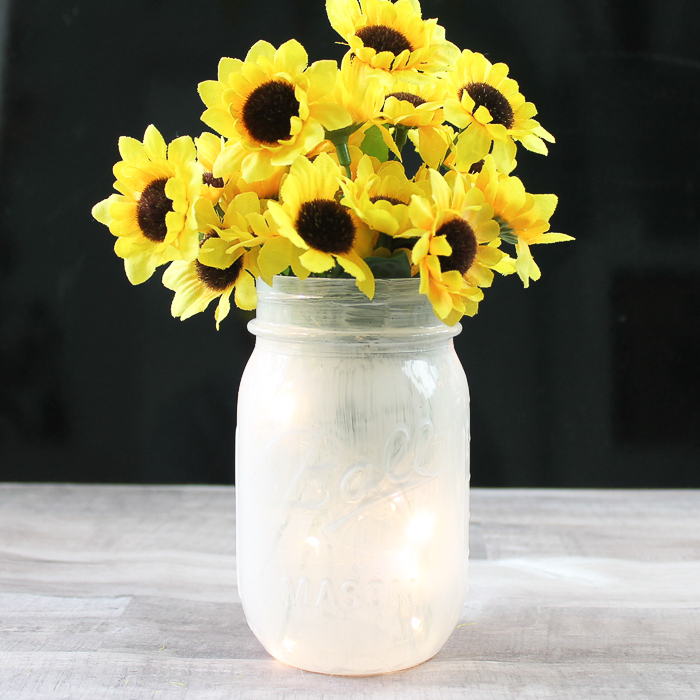 Be sure to pick up your mason jars, flowers, and some battery operated lights at your local dollar store. Then just add on the paint. That makes it one inexpensive craft idea! 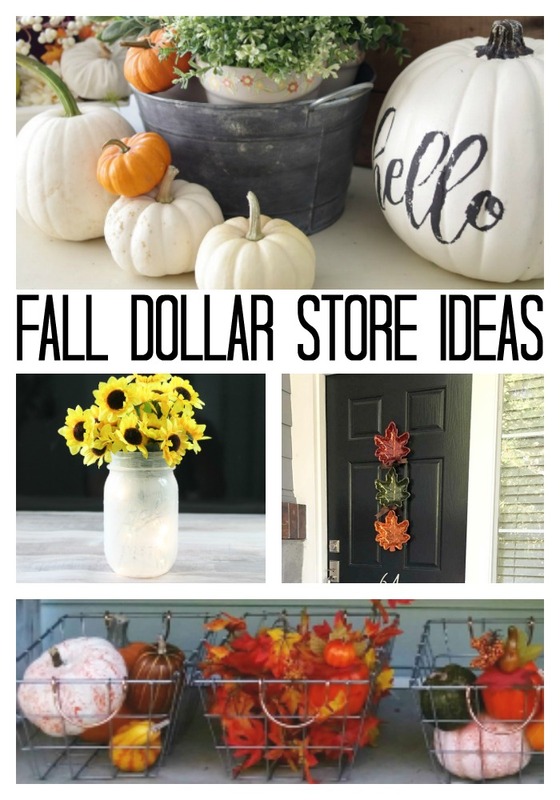 Want more ideas from the dollar store? I have those for you as well. I am joining with several other bloggers for some fun dollar store projects in addition to this fairy lantern this month! See all of the ideas below. So fun and easy Angie! I love how your fairy lantern turned out. Isn’t it so fun to paint glass? The small lights are perfect. Very pretty and such a soft glow…Thank you for sharing at Party In Your PJs! Very pretty! I love the soft glow of the fairy lights! Thank you for sharing at Celebrate It! So fun and easy! These would look great in my daughter’s room. Thanks for sharing! That is so pretty! I just love the soft muted glow. Pinned.